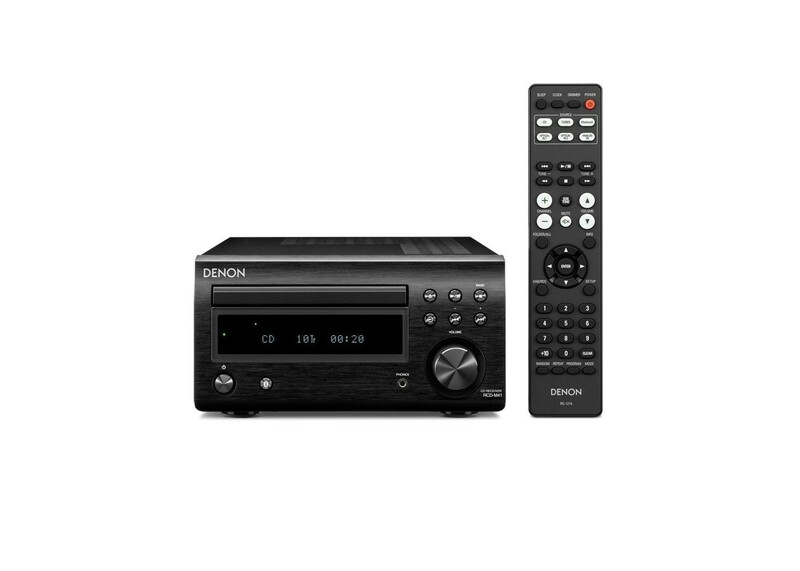 You will receive: 1 Denon DM41SBK Black Micro Hi-Fi System. Building on the multi-award winning D-M40, the new D-M41 features improved sound, style and facilities. The newly-developed discrete analogue amplifier circuit reduces signal paths for greater clarity and impact, while the new Bluetooth implementation combines convenience with an off switch to reduce its influence on the sound of other sources when not in use. Meanwhile the new cosmetic design echoes that of Denon's flagship 'NE' separates. The RCD-M41 center unit also has two digital optical inputs to hook up a TV, set-top box or other digital gear that deserves improved audio quality, and has built-in CD plus FM/AM radio, with the new SC-M41 speaker system to complement the CD receiver's performance. Denon’s engineers have completely rethought the design, from the styling and facilities right through to the audio circuitry, to offer even more performance and value. The new amplifier circuit delivers 2x30W, so the RCD-M41 has more than enough power to drive either the matching SC-M41 speakers or other popular choices and there’s also a dedicated headphone amplifier section for personal listening. Denon’s popular M series gives you high sound quality based on the “simple & straight” concept. Circuitry is uncomplicated, signal paths are short, and all adverse influences on sound quality have been minimized. The circuit design and the way the chassis is built ensure that the sound you hear is utterly faithful to the original performance. The compact size of 210mm width and just 310mm depth (plus speakers) allows for an easy setup of the D-M41 on a bookshelf, in a bedroom or in the home office. With several color combinations, it easily blends into your lifestyle, delivering impeccable performance at the same time. These speakers have been designed with Denon Hi-Fi craftsmanship. For best performance, a high quality 12 cm woofer / midrange chassis has been combined with a high definition tweeter and a crossover network with selected components to reproduces the smoothness of natural sound.